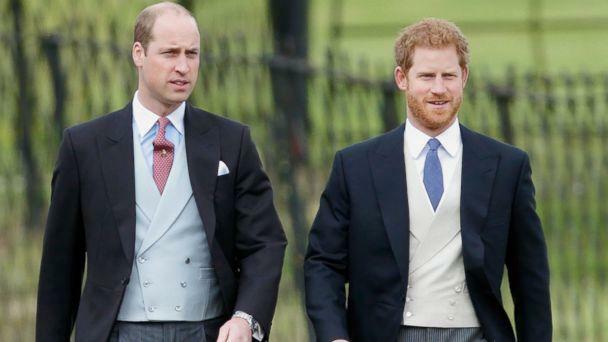 In a new BBC documentary, Prince William and Prince Harry reveal how they learned about their mother's heartbreaking death in 1997 and how their father, Prince Charles, and grandmother Queen Elizabeth comforted them in the aftermath. "One of the hardest things for a parent to have to do is to tell your children that your other parent has died," Harry said in the documentary, "Diana, 7 Days." "How you deal with that? I don't know. But you know, he was there for us. He was the one out of two left, and he tried to do his best and to make sure that we were protected and looked after," Harry said of Charles. "But you know, he was going through the same grieving process as well." "I remember just feeling completely numb, disorientated, dizzy," William said. "You feel very, very confused. And you keep asking yourself, 'Why me?' All the time, 'Why? What have I done? Why? Why has this happened to us?'" 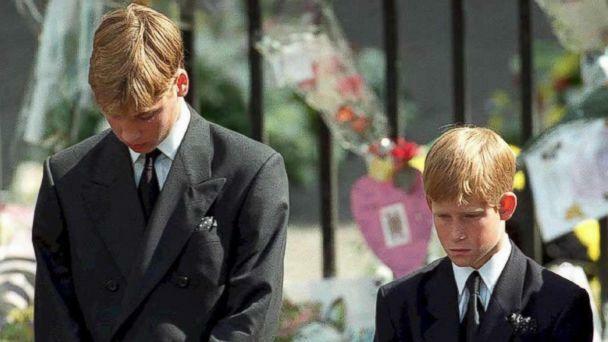 William and Harry were 15 and 12, respectively, when their mother died in a car crash in Paris. The young princes were vacationing at Balmoral Castle in Scotland with their father when they heard the news of Diana's death. Queen Elizabeth was criticized at the time for shielding the boys from the public and allowing them to grieve in private, but William and Harry have praised her decision. William reflected on the complicated feelings he and his brother were having in the immediate aftermath of Diana's death and the brave faces they tried to put on in public, saying, "I think it was a very hard decision for my grandmother to make." "She felt very torn between being a grandmother to William and Harry and her queen role," William added. Harry said, "It was a case of 'How do we let the boys grieve in privacy but, at the same time, when is the right time for them to put on their prince hats and carry out duties?'" The royal family went to Crathie Kirk Church near Balmoral Castle shortly after Diana's death and upon their return viewed hundreds of floral tributes and notes laid outside the castle's gates. "I was very touched by it, but none of it sank in," William said in the film. "All I cared about was, I'd lost my mother, and I didn't want to be where I was ... When we go out and do things like that, in order not to completely and utterly break down, we have to put on a bit of a game face," William said. "And you have to be quite strong about it because otherwise you're a walking mess." Harry said, "Looking back now, probably the last thing I wanted to do was read what other people were saying about my mother." "Yes, it was amazing. It was incredibly moving to know, but at that point, I wasn't there. I was still in shock," he added. William and Harry also shared how their grandmother hid the newspapers from them at Balmoral Castle at the time so they would not be aware of the intense media coverage and the details of their mother's death. "Back then, obviously, there were no smartphones or anything like that, so you couldn't get your news, and thankfully at the time, to be honest, we had the privacy to mourn and collect our thoughts and to have that space away from everybody," William said. "We had no idea that the reaction to her death would be quite so huge." 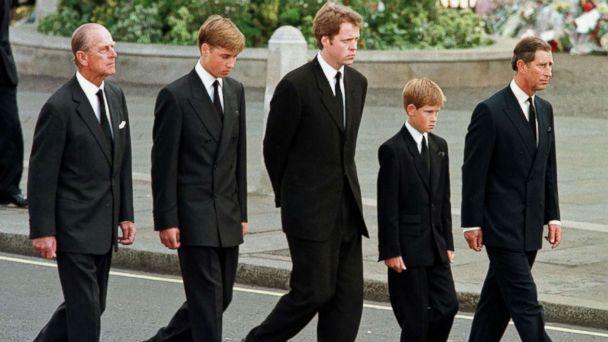 The documentary explores William's and Harry's feelings about walking behind Diana's coffin in the funeral procession — which still haunts them, 20 years later. Harry, the fifth in line for the throne, told Newsweek this spring, "I don't think any child should be asked to do that, under any circumstances. I don't think it would happen today." The brothers described the walk behind her flower-draped casket as a "group" decision. They were unwilling to point fingers at who compelled them to walk in the funeral cortege while they were still grieving. Harry elaborated, sharing that, in retrospect, he was grateful to participate in the procession and to make his mother "proud." "Generally, I don't have an opinion on whether that was right or wrong. I am glad I was part of it. Looking back on it now, I am very glad I was part of it," Harry said in the documentary. William said, "It wasn't an easy decision, and it was sort of a collective family decision to do that. It was one of the hardest things I have ever done." He added that there was "this element of duty and responsibility that you have to do things you don't want to do." "I have to say that whenever it becomes that personal as walking behind your mother's funeral cortege, it gets to another level of duty," he said. "But I just kept thinking about what she would want and that she'd be proud of Harry and I being able to go through it." He added that it was difficult to "balance between me being Prince William and having to do my bit, versus the private William who just wanted to go in a room and cry because he'd lost his mother." William described how he bowed his head, hoping to hide behind his long bangs. "It was kind of like a little tiny bit of safely blanket," he said. "I know it sounds ridiculous, but at the time I felt if I looked at the floor with my hair in my face, no one could see me." Harry said, "I was just so focused on getting it done and doing everything that was asked of me there and then and making sure that I did my mother proud." He said he nearly cracked and broke down during the funeral service, particularly when he listened to a poignant musical dedication to his mother inside Westminster Abbey. "Elton John's song was incredibly emotional. That was part of this whole trigger system, which nearly brought me to the point of crying in public, which I didn't do," Harry said. Perhaps most heartbreaking was William's and Harry's anger at what happened in the Pont d'Alma tunnel in Paris immediately after the car that Diana was traveling in crashed. Bystanders watched their mother as she lay dying in the wreckage and, instead of offering help, took gruesome pictures for profit. "I think one of the hardest things to come to terms with is the fact that the people that chased her into the tunnel were the same people that were taking photographs of her while she was still dying in the backseat of the car," Harry said. "And William and I know that. We've been told that numerous times by people that know that that was the case." He continued, "She'd had a quite severe head injury, but she was very much still alive in the backseat and those people that, that caused the accident, instead of helping, were taking photographs of her dying in the backseat, and those photographs may have made their way back to news desks in this country." The brothers admitted that they questioned their royal duty. "Years after, I spent a long time in my life with my head buried in the sand, thinking, I don't want to be Prince Harry. I don't want this responsibility. I don't want this role. Look what's happened to my mother. Why does this have to happen to me?," Harry said. With time, however, William and Harry are now even more dedicated, given the events surrounding Diana's death, to carry on her legacy. "Now all I want to do is try and fill the holes that my mother has left, and that's what it's about for us — is trying to make a difference and in making a difference, making her proud," Harry said. "She was the Princess of Wales, and she stood for so many things, but deep down inside for us, she was a mother. And we will miss our mother, and I wonder every single day what it would be like having her around." William said, "I wouldn't let it break me. I wanted it to make me." "I wanted her to be proud of the person I would become, and I didn't want her worried or her legacy to be that William or Harry were completely and utterly devastated by it," he added. "She loved Harry and I dearly, even so that I can sit here after 20 years and I still feel that love. I still feel that warmth 20 years on, which is a huge testament to her." "If I can be even a fraction of what she was, I'll be proud, and I'll hopefully make her proud in what I've done," William said. "Diana, 7 Days" also features candid insight from her brother Lord Charles Spencer her sister Lady Sarah McCorquodale, who has rarely spoken since Diana's death on Aug. 31, 1997. Lady McCorquodale said Queen Elizabeth "did absolutely the right thing" in protecting William and Harry at Balmoral, adding, "If I was her, I would have done that." She also recalled being "angry" at the news coverage after the car accident that claimed Diana's life and said she still wonders why Diana was not wearing her seatbelt on the night she died. "She was religious in putting on her seatbelt," Lady McCorquodale said. "Why didn't she put it on that night? I'll never know." Speaking of the news coverage, Lady McCorquodale recalled, "There was a period of two hours and I was talking obviously to other members of my family and learned that she hadn't made it, and for these two hours the presenters on every news channel were saying 'injured but expected to make a full recovery.'" "And I have no idea why but it made me so angry," she said.